The Languor Quartet now had a second member, Pensive.. Each of the quartet is available for purchase as original hand-prints, or fine art prints in a variety of sizes and media including metal. Invite one of these women to grace your walls, and use the wall preview tool to imagine it! As with all original hand-print art, there may be a slight variation in image, due to the handprinted quality of the art. All original prints are available for free shipping. Measures 12x12 and handprinted on a base sheet of 16x16.Matted in neutral white acid-free mat and backing board, shipped carefully via FedEx in a flat box. You will be refunded your shipping fee, with a check, enclosed in your package. A small edition of hand made and signed and numbered prints are still available. You will notice the Japanese calligraphy in sections of this restful linocut print. 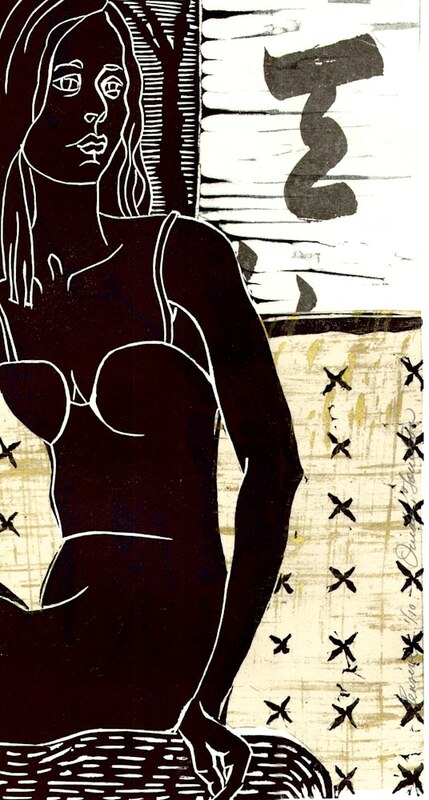 Linocut with chine colle collage, this is one of a series of 4 images of languid women, titled the Languor Quartet. This one is number 2 in the series, and is titled 'Pensive'. It is available as an original, signed and numbered, from an edition of 10 or as an archival print in a number of sizes and media, including paper and canvas. As with all original hand-print art, there may be a slight variation in image, due to the handprinted nature of the art.